The ICM-8, 16, 24, & 32C are complete Intercom Control Master, ruggedized for use in harsh environments such as correctional facilities while providing high quality audio communication with complete control. The ICM-*C was designed to withstand physical attacks and deliberate abuse designed to disable the unit. These units feature a 12-gauge stainless steel faceplate, vandal resistant steel selector switches and vandal resistant LEDs. The integral speaker and microphone are mounted in such a way to prevent physical damage to the components from objects and liquids that could cause these components to stop working. The chassis is constructed of rugged, powder coated steel. Field wiring for speakers and call buttons is connected to the unit using an industry standard 50 pin connector. A metal “keeper” prevents users from unplugging the field wiring and thus disabling the unit. 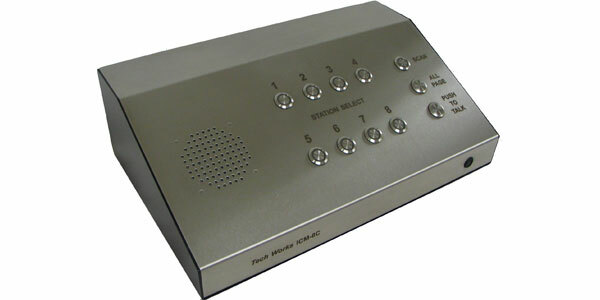 The ICM employs our unique intercom amplifier with discrete dual channel operation. Separate Operator and Remote amplifiers, AGC, level, and reach controls are used to provide complete control and quality audio at 20 Watts of output into a 25Volt- industry standard speaker loads. A Scan allows the operator to listen to each station sequentially when the intercom is not in use. As a station is scanned, the associated LED flashes and the operator automatically hears audio from the scanned station. If the operator hears something of interest, they press the button corresponding to that station and scanning is paused. When monitoring is complete, pressing the button a second time resumes scanning where it left off. Station Scanning is programmable for which stations and dwell or listen time. The “Page” button allows the operator to make announcements to All Stations or selected “Zone” stations. Zone Paging is programmable and can include any combination of stations including All stations at one press of the “Page” button.